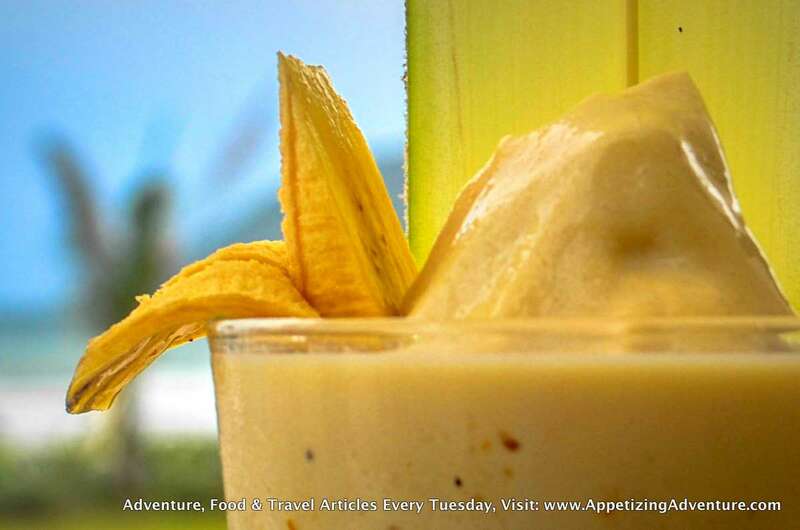 Luxurious tropical dining experience is what you’ll get at the Beach House. To help you choose from their menu, here’s my TOP 5 list of items you should order. 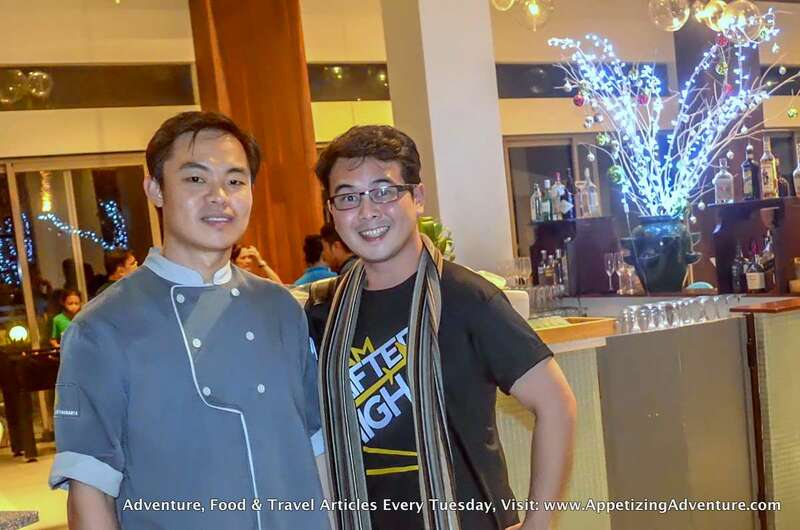 I interviewed Chef Ronald Marantal to help describe the selection. 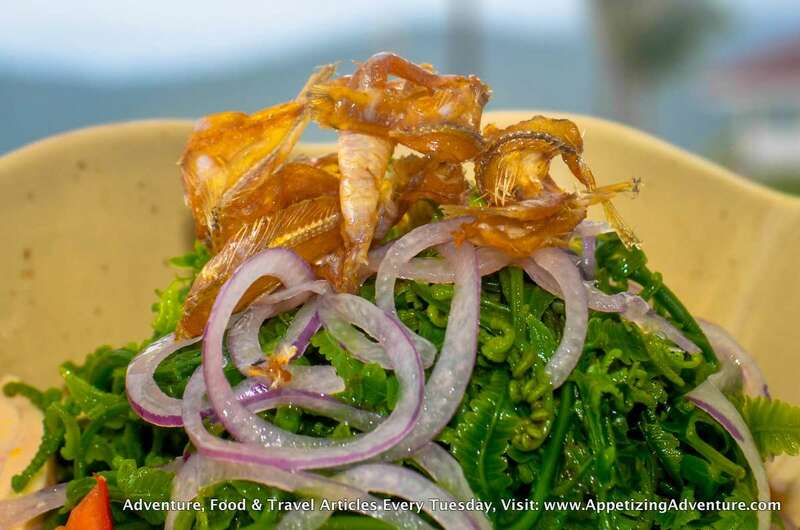 This salad highlights the most popular vegetable in Baler, the fiddlehead fern, known locally as pako. Their version of this salad comes with salted eggs, tomatoes, and onion. For the crunchy texture, it’s topped with biniklad na dilis, or crispy butterflied dried baby fish. The dressing is made of bagoong Balayan, a Filipino condiment made of fermented fish. If you want healthy, this is definitely for you. The Daily Grill has the catch of the day as the star of the show. It depends on the fish available in the market. It could be white marlin, tuna, or dorado. 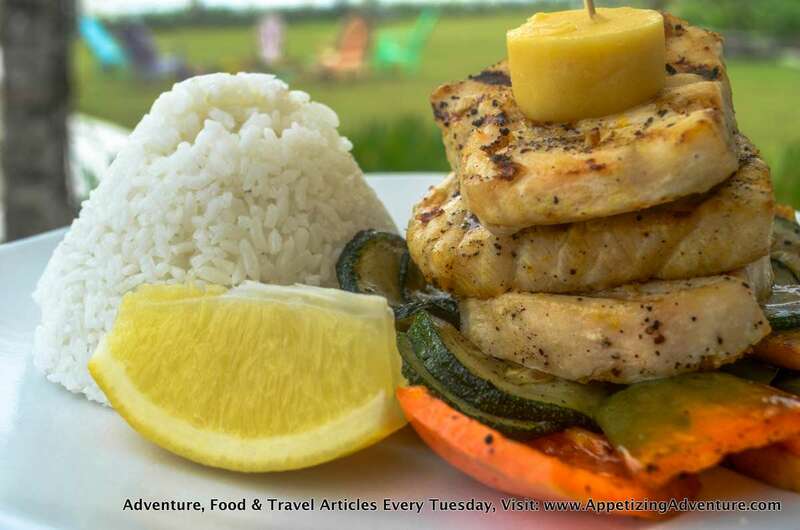 The fish is seasoned with salt and pepper, and then grilled with lemon. It’s served with rice or fries, roasted vegetables, slice of lemon, and miso ginger butter. This drink is energizing and full of flavor! It’s made of banana, peanut butter, condensed milk, and coco jam. The peanut butter taste dominates the drink. I love it. This really melts in your mouth. Bananas and chocolates go well, and this dessert gives you those two complementing treats. The brownie was so moist, that some parts of it were like thick liquid in texture — I enjoyed that a lot! 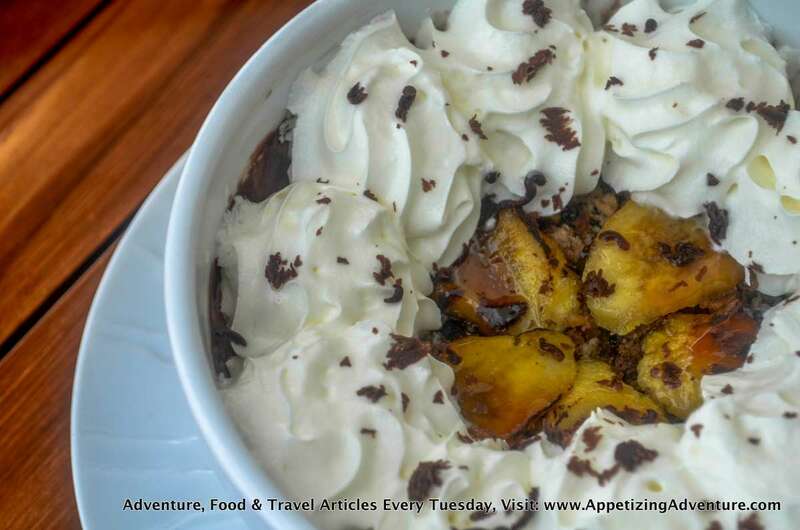 It’s topped with caramelized bananas and whipped cream. This has got to be the best bagnet ever. My friends and I were overwhelmed at how good their bagnet was. 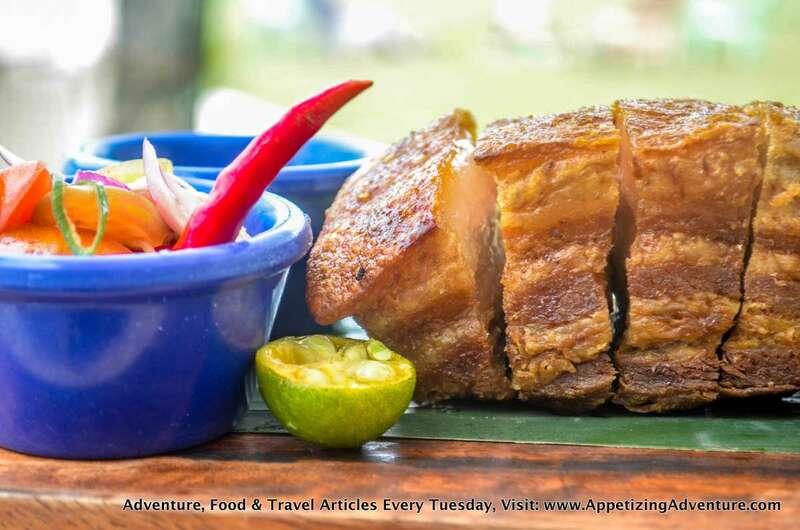 I’ve been to the best restaurants in Ilocos where bagnet supposedly originated, so I pretty much think I have some credibility here. But there are still other factors to be considered. I don’t know if we were just really hungry, if the ambiance put us in such a great mood, or if their bagnet was just absolutely amazing. It was very crunchy on the outside, and tasty and tender inside. Chef Ronald said their pork was marinated for an hour, seasoned with salt and pepper. It was then cooked in its own fat for four long hours (no wonder it’s that tender). They allow it to rest and is only deep-fried until crunchy before serving. That’s chicken satay and lemongrass pork belly with spicy coconut-peanut sauce, fragrant coconut rice, and macaroni salad. 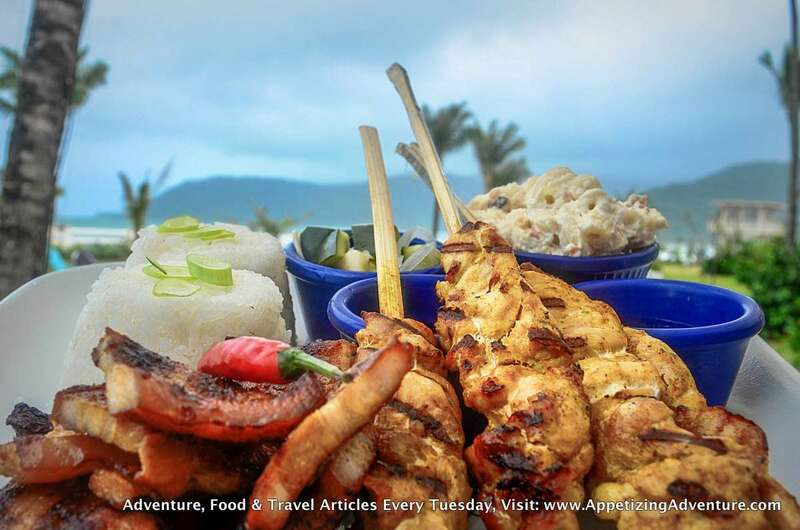 The grilled pork liempo goes with the sauce made of vinegar and soy sauce, while the chicken satay is dipped in the peanut sauce. From all the buko pandan desserts I’ve tried, their version is the coconuttiest. I mean it’s the only one of its kind that has an overpowering coconut taste. 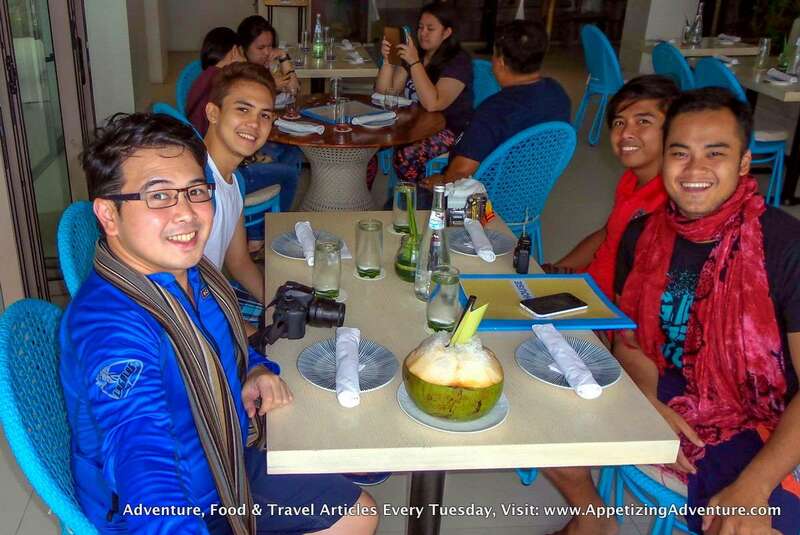 I think it’s because of the roasted coconut shavings and coconut cream that are not present in other buko pandan desserts. Chef Ronald said they roasted the coconut for 30 minutes, which really brings out the flavor. 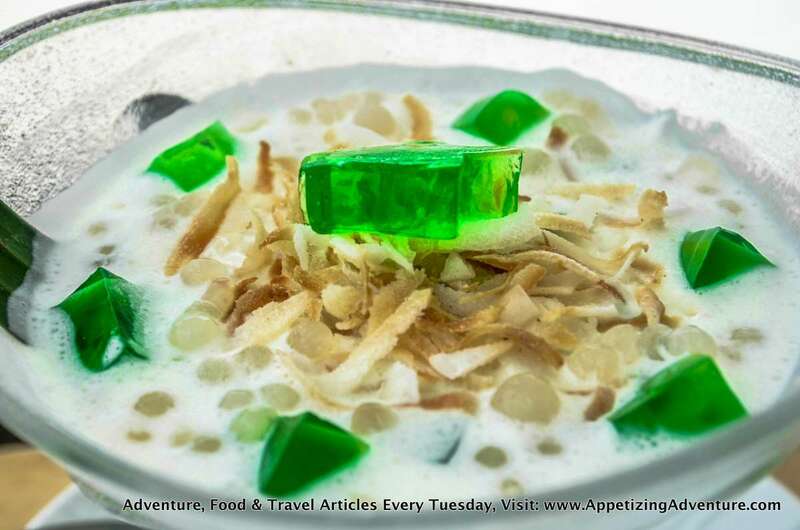 It also comes with sago pearls and pandan jelly. Fresh coconut in its shell served with crushed ice on top. 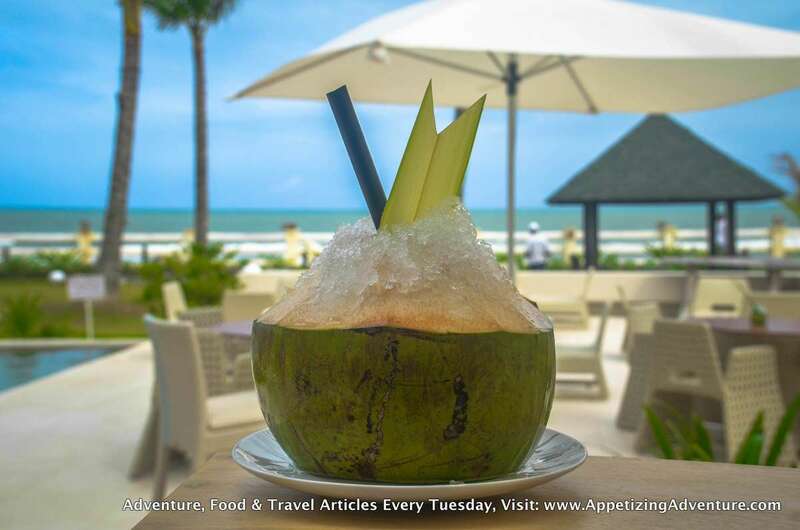 After you finish the coconut water, ask the server to shave the coconut meat for you. 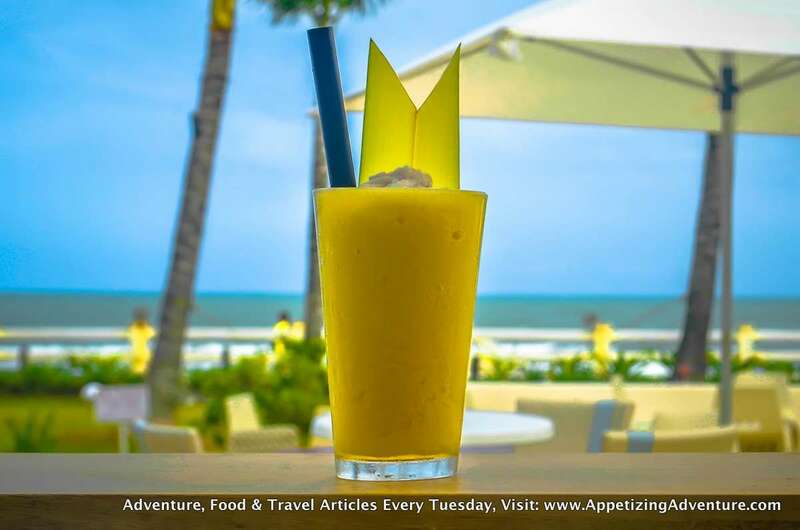 Pineapple, mango, and passion fruit smoothie. It’s a tropical delight. 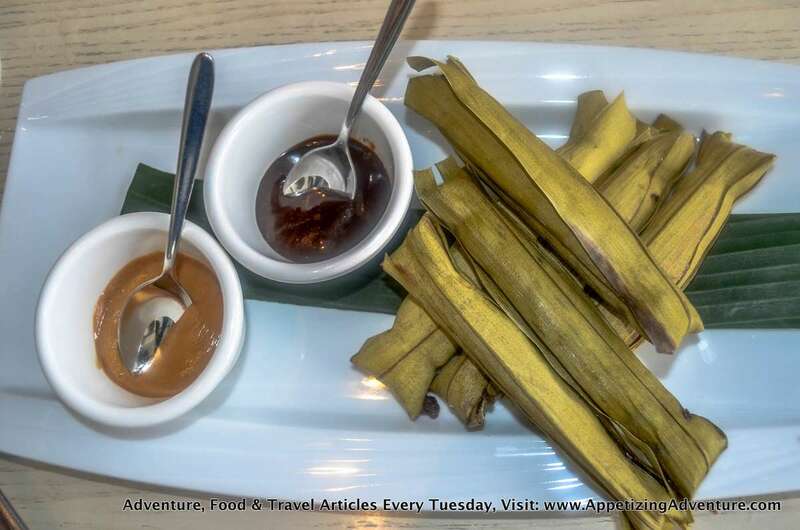 That’s sticky rice in banana leaf with Nanay Pacing’s coco jam and peanut butter. Nanay Pacing is famous in Baler for her peanut butter and coco jam. 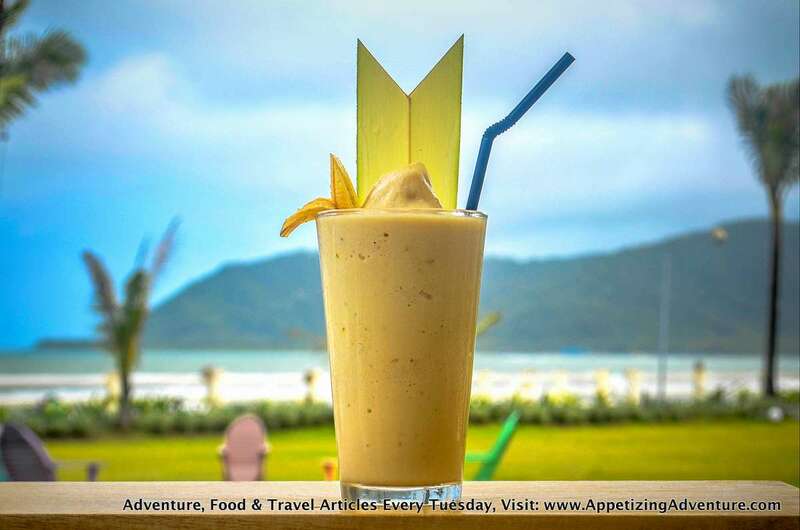 Click here for more photos of from the Beach House and food items from the menu.